This is the place to find NAPgA’s “Best Management Practices” and recommendations for keeping your goats safe and contained on the trail, as well as preventing contact with wildlife in camp and on the trail. 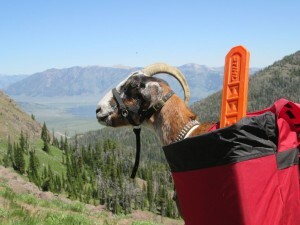 We also maintain a list of packgoat-related businesses such as breeders, equipment suppliers, outfitters, guides, and packgoat rentals. You can also download and print NAPgA flyers and handouts. Andy Irvine’s comments on the Shoshone NF RADT and SDEIS – This is an incredible document put together by NAPgA’s lawyer in response to Shoshone’s Risk of Disease Transmission and Environmental Impact Study. Faulty science has been used to unjustly ban packgoats from this area, and Andy addresses all of those issues in great detail. The NAPgA Summary of Understanding is a document outlining findings from the 2016 study conducted by Dr. Maggie Highland of WSU on the prevalence of mycoplasma ovipneumonia (M.ovi) in packgoats.